It should because, according to the monomyth theory, it’s basically the plot of every story, campfire tale, bard song, book, movie, and plot-based video game ever created since the dawn of humans. 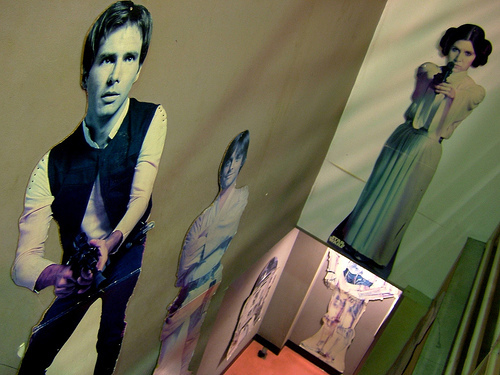 Sweet Star Wars stairwell! Source: River Seal Band on Flickr. Refusal of Call: Luke says no. Granted #3 and #4 are switched from the norm, but the order isn’t set in stone. Help from Mentor: Luke meets Obi-Wan. Crossing First Threshold: His foster parents are killed. Tests, Allies, Enemies: Luke blasts out, meets Hans and Chewie, and fights Storm Troopers. Approach to Innermost Cave: He’s sucked into the Death Star. Supreme Ordeal: Luke rescues Lea. Reward: He takes Lea back with him. Road Back: They escape the Dark Star assault. Resurrection: Luke returns to the hangar. Return with Elixir: Luke and his companions are honored in a ceremony. Can you chart your life’s journey on this outline? Or if you’re not ready for that leap yet, how about your favorite book, game, or movie? Feel free to note your musings in the comments. And if you’re a writer, happy-hour philosopher, or just find this subject interesting, I highly recommend Joseph Campbell’s The Hero’s With a Thousand Faces and his PBS interviews, The Power of Myth (online, Netflix streaming, etc. ).